When we think of VVS Laxman, we always think of the divine gift he was born with. We think of the timing, the grace, the wristy shots. But his elegance cloaks an intense mental strength that is not highlighted often enough. He has batted at different positions, he has been in and out of the team a bit, and he has batted alongside a pretty good middle order; but because he doesn't look like he is making a lot of effort when batting, we tend to forget that there is a lot of hard work involved in what he does. Now that he has reached 100 Tests, it's time to celebrate his longevity and what lies behind it. He has had his share of injuries. He has coped with them, played through them, and a lot of it comes down to his mental strength. Our partnership extends to standing next to each other in the slips. He has been one of the best slippers I have stood with. We spend a lot of time on our slip catching. Both of us have that conscious drive to be good slippers. That we have built a good slip cordon has been a significant factor in our winning more games over the last ten years or so. Standing in slips we talk about a variety of subjects. He has always been interesting to talk to: he is a wise man, has an infectious laugh, and is one of the most positive persons around. We keep bouncing ideas off each other - whether about the game or other subjects. We both have young children, and sometimes the conversations are about how Samit [my son] is doing and how Sarvajit [Laxman's son] is doing, and which school to send them to and why. That way we manage to switch ourselves on and off in the slips. In the dressing room, you'll always find Laxman with his Walkman on, lying down, or sleeping somewhere. Even if it's before he has to go in to bat, you see Laxman under a table catching up on sleep. It always boggles my mind that amid the noise and clutter of the dressing room, here is a man, who needs to go in to bat in a short while, sleeping calmly. Till he walks out to bat, he always gives you anxious moments. He waits until the last minute to get ready. If he is batting overnight, or has come back not out for lunch or tea, you see him padding up once the umpires have started to walk out. "What's happening Lax? Get ready," is the usual cry. But that's until he walks out. Laxman has a lot of balance in his cricket and in his life. He doesn't get carried away with a lot of success, neither does he let failure bog him down. Sure, like any other player he gets excited when he is doing really well, and disappointed when he is not. But he is different in that he never lets it get to his head. He has the ability to bounce back, which allows him to remain calm through turbulence. You can sense that he makes a conscious effort to bring equanimity to what he does. He had a lots of ups and downs in the initial part of his career: in the first three to four years he was prone to emotion like any other youngster. In the last eight to ten years, though, he has brought a certain poise to his cricket, and you can see that he has pulled it off well. Part of that comes from his parents. Both of them are doctors, and they had a huge influence on the way he grew up. Laxman has learnt from watching the way they have led their lives, and the sort of work they have done for people and society. He sees cricket as his opportunity to do what his parents did: bring joy to people. He realises that cricket is his gift. It comes through not only in the way he plays but also the way he carries himself. 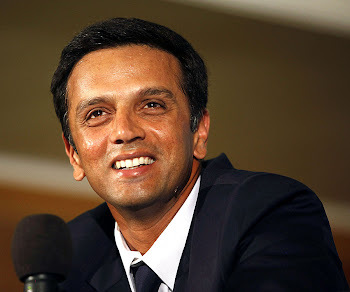 I first met Laxman as a 17-year-old, when he had already made his mark in junior cricket. We had heard of this tall boy from Hyderabad who was destined to be a very good player. It was pretty evident then that he was a special talent. That's true of many young players but not many go on to fulfill that potential. Laxman has. He has looked to improve constantly, and not just with his cricketing technique. He reads quite a bit, and is open and willing to try different things that can improve his performance. That's a key to survive for 100 Tests. Laxman and I go back a long way. We played together in many Under-19 tournaments, and also for South Zone. We have toured together as youngsters, when both of us were looking to make our way into the Indian team. It's been great to share some really big partnerships with him - critical match-winning ones, and not only at international level but in junior and domestic cricket too. I have fed off him. We complement each other well in the way we bat together. We don't need to talk too much when we are batting together, because we know each other quite well. After having played together for so long we know the tempo and rhythm of each other's game. And if it is not happening for either of us, all it needs is a quick reminder from the other. The partnership against Australia in Kolkata was really special. We started the fourth day with Laxman already batting on 109, but we didn't really believe we could win the Test. All we thought we could do was fight and make it really hard for Australia. But with each passing hour we started to sense we were onto something special. Laxman's innings there is the greatest I have seen. To watch some of those shots from the other end was phenomenal; it was like watching a highlights package. When we came back at the end of the day we were totally exhausted. We were lying on beds next to each other, taking drips. We could both sense that we had done something unique, something that would define our careers from then on, irrespective of what we achieved or didn't achieve after that. When he walks in, whether you are batting in the middle or sitting in the pavilion and a wicket has fallen, he brings calm to the whole dressing room. I, personally, get a feeling of calm and solidity, not because Laxman will always score but because you know that he will never let you down in terms of effort: you know that he is there and he will pull his weight. There is no higher compliment. You know he has the requisite quality, and that he can read situations well. He has turned up in every circumstance: bad pitches, good pitches, when setting a total or after the opposition has piled up a big score. It's been a long journey: Nagpur will be the 99th Test I will be playing alongside him. Over the years he hasn't changed much as a person. Deep down he is the same. His family means a lot to him and his marriage has added to the balance he already had. If anything, he has grown more confident. We started together at U-19 level and have seen each other grow. It's been a terrific journey, and to watch Laxman evolve has been a true privilege.